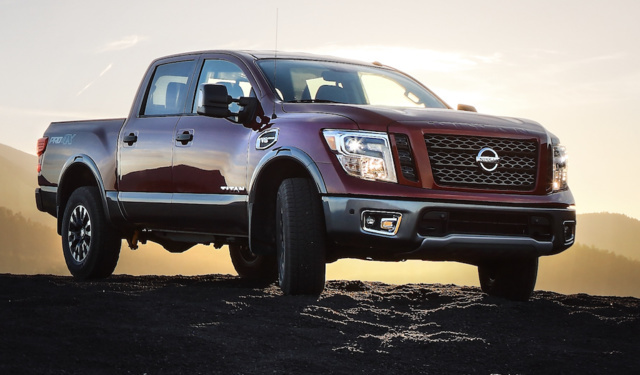 Have you driven a 2018 Nissan Titan? Displaying all 7 2018 Nissan Titan reviews. The SL was the best value that I came across, so I bought it. Power Ranked 2018 Nissan Titan XD PRO-4X Crew Cab 4WD better. Cargo Capacity Ranked 2018 Nissan Titan XD PRO-4X Crew Cab 4WD better. "It was just a larger truck with heftier suspension and towing capacity. Diesel engine." the XD was just too Expensive and big for me. Great truck, just too much in expense and size. Good truck, but not a Tundra! Excellent mileage and roomy interior with all sorts of standard options on this trim package. Power is great and so is towing capacity. Power Ranked 2016 Toyota 4Runner TRD Pro 4WD worse. "V-8 with way more HP and TQ than the Toyota." Front Seats Ranked 2016 Toyota 4Runner TRD Pro 4WD worse. "Heated and Cooled, and they extend further back for us tall guys." Perfect! SV comes standard with push button start, auto climate control comes on SV convenience package, $20k cheaper than an F150. I bought an SL for $43k, Leather, 4x4 auto climate control, and push button start. Looks/Style Ranked 2018 Ford F-150 Lariat SuperCrew 4WD better. Value Ranked 2018 Ford F-150 Lariat SuperCrew 4WD worse. CarGurus has 20,622 nationwide Titan listings starting at $3,500.